My dad sent me and email this morning that read, "How's this for design?" Thanks, Dad! The city car of the future will seat two people, run on electric power and communicate with other vehicles to reach a destination faster while automatically avoiding traffic tie-ups and crashes. General Motors, working with electric-scooter maker Segway, has developed three concepts tailored toward that vision of future transportation. 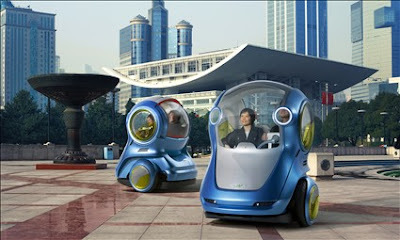 The Electric Networked Vehicle, or EN-V, concepts go on display May 1 at the World Expo in Shanghai. Well, it may not be quite as nerdy as a Segway, but I would certainly hate to encounter a Hummer in this car. I watch news in Chinese every night and I totally saw this! crazy! My husband said that we should buy one once we get to Beijing. LOL! I am going to the Shanghai world expo and will definitely post pictures! Probably in June. PS I'm following you now! Thanks, Steph! Can't wait to see your pictures from the expo!